The Smith & Wesson M&P Compact in 9mm, M2.0 pistol features superior ergonomics, a reinforced polymer frame, striker fire action, and ambidextrous slide stop release. 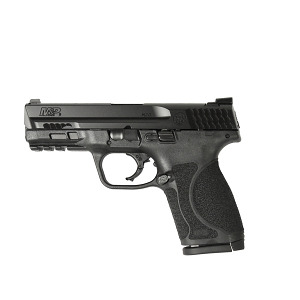 The choice of many law enforcement professionals, the M&P is a versatile defensive pistol. Ships with 2 additional sized backstraps, two 15RD magazines, manual, lock, and case. Features a 4" barrel, 3 dot white sights, Black Melonite® finish, and accessory rail.